The building’s new owner is the Randall Group, a prominent locally based owner of numerous residential and commercial buildings. The stated reason for the forced eviction is to undertake a major remodel resulting in much higher rents. 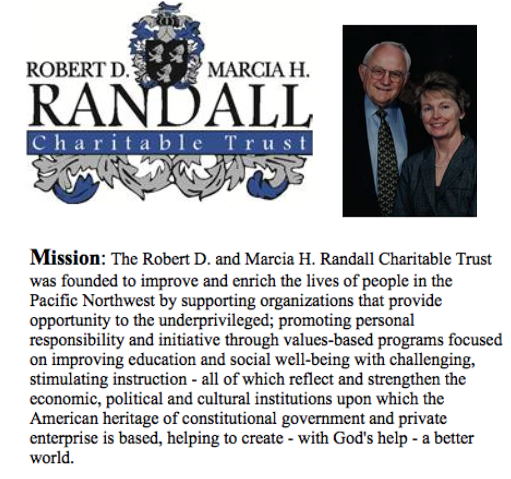 The Randalls are prominent local philanthropists and make significant contributions to OHSU. Rather than use its own property management subsidiary, CTL, the Randall Group has chosen instead to use Norris Beggs, Simpson. Tenants were offered the last two months free rent if they stay until the eviction date, December 31, 2015. At the same time Norris Beggs is advertising short term rental rates below current tenants rates. Of course some of the long term tenants find this disappointing. Ironically, the Randall Group receives a significant amount of financing from tax exempt public pensions via CBRE, what they call structured finance in the real estate industry. In 2012 Oregon PERS invested $100 million in one such CBRE fund. Unlike New York, there is no rent control in Portland, Oregon and therefore this type of forced eviction effective December 31, 2015 to pave the way for a significant rent increases is an accepted business strategy. In New York prominent private equity firms regularly purchase rent control buildings, financed by public pension co-investors including Oregon PERS, with the stated strategy of forcing a certain percentage of renters out of their apartments by cutting off utilities, not making key repairs, etc, what could be considered suggested evictions. By doing this, they can often raise the rent 500 percent for new occupants. Where it gets interesting is that the Oregon Historical Society was playing by the rules in that it held its ownership of the apartment building in a taxable subsidiary C corporation. Therefore, they paid full taxes on its income, including $1.3 million or a 40 percent overall tax rate on the gain at the time of sale. The following footnote is from the 2014 annual audit report. 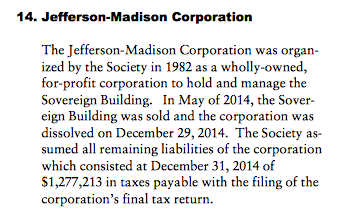 Note the taxes paid on the sale, again, the society is a tax exempt entity. 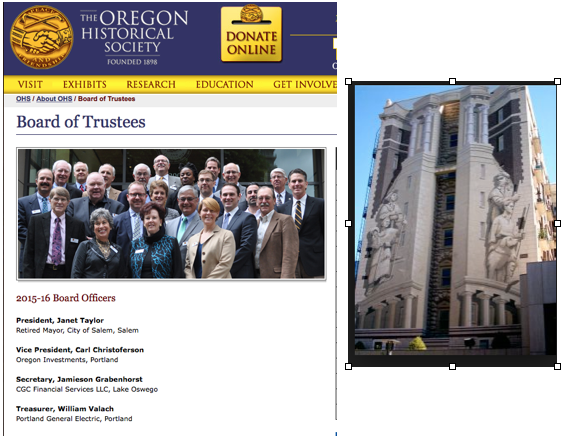 So while the Historical Society is playing by the rules, other prominent Oregon based foundations including the Meyer Trust, Oregon Community Foundation, Ford Foundation and others invest aggressively in private equity based real estate partnerships that use foreign blocker corporations based in the Cayman Islands and pay no tax on either their income from the investments nor from gains on sales. This is similar to Goldman Sachs renting a Post Office box in the Caymans, claiming it as its main office, and averting billions in taxes. Tax attorneys call this tax efficiency while other more simply minded might consider it criminal tax evasion. The solution is simple and that is to make sure any tax reform plans also incorporate various tax-exempt entities. My proposal would be to provide tax free treatment on investment gains for tax exempt entities only if an investment is held 5 years and standard capital gain treatment if held less. The only exception would be investment in government issued securities, the gains of which would be tax free without exception. Of course an added benefit would be to reduce the rampant speculations being made with tax exempt investment funds, or as one prominent short-seller Jim Chanos says, only tax exempts should short sell due to “tax efficiency” reasons. It will be interesting to see how long the Randall Group hangs on to the Sovereign building or whether it will be sold to a private equity real estate pool using an offshore blocker so that tax exempts can invest and pay no tax on income or gains from sales. Even CPA firms better known for crafting tax strategies have moved aggressively into private equity. One such firm, which began as the CPA firm Parrot and Associates, now calls itself Vergepoint Capital. It recently sold a $52 million complex to the Randall Group with financing provided to Randall by CBRE. The next chapter in the Sovereign’s life might simply be a takeover by another more “tax efficient” tax exempt. Not only is this bad public policy yet it is also aggravating an acute shortage or reasonable housing in downtown Portland. It is astonishing how leading Presidential Candidates banter about tax rates with no recognition that public pensions, foundations and endowments via investments in offshore based private equity and hedge funds now control trillions of the US economy, and since they pay no tax on either income or gains, no tax reform will work without bring a discussion of tax exempt to the table.